February 10, 2014: Israel's Rafael Advanced Systems entered DefExpo 2014 on a high, after reportedly bagging a massive contract for over 150 LITENING targeting pods for the Indian Air Force's combat aircraft fleet. 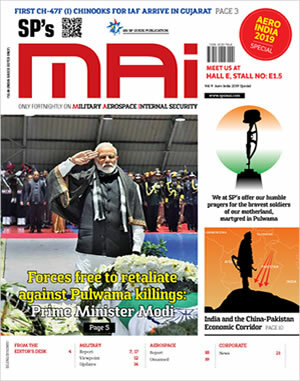 A spokesperson for Rafael wouldn't confirm details but indicated to SP's that the LITENING pod had been chosen by the Indian Air Force for its frontline fighter aircraft, including the Su-30 MKI, MiG-29 and others. 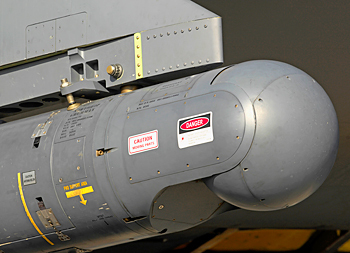 The LITENING G4, which began to be delivered to U.S. forces in 2008, is, according Rafael partner Northrop-Grumman, a combat proven, self-contained, multi-sensor targeting and surveillance system, enabling aircrews to detect, acquire, auto-track and identify targets at extremely long ranges for weapon delivery or nontraditional intelligence, surveillance and reconnaissance missions. LITENING’s 1K FLIR, 1K charged-coupled device (CCD), laser imaging sensors, advanced image processing and digital video output provide superior imagery, allowing aircrews to identify and engage targets under a wide range of battlefield conditions. Integrated on a wide variety of aircraft including the AV-8B, A-10A/C, B-52H, EA-6Bs, F-15E, F-16 and F/A-18, LITENING is in operation with the U.S. Air Force, Air National Guard, Air Force Reserve Command, U.S. Marine Corps and several other nations.